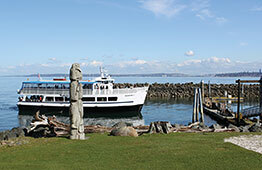 The birthplace of Chief Seattle, Tillicum Village is a unique cultural experience that is one-of-a-kind. Proud to be the only Native American experience of its kind in the Northwest, Tillicum Village is the only place in the world where you can see the specific dances and hear the songs performed by the very dancers whose families have owned them for generations. Upon arrival at Tillicum Village, you will be greeted with steamed clams in savory nectar. You will be seated in a cedar longhouse and watch as salmon is carefully prepared over open fires as it has been for centuries. Once the salmon has finished cooking, you will get a chance to taste it for yourself, along with a delicious buffet meal. 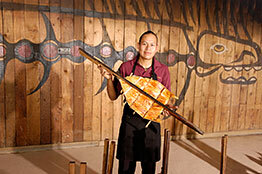 A traditional Native American dance will be shown after your meal along with a one-of-a-king stage performance and imagery combining Coast Salish storytelling by local native storyteller Roger Fernandes of the Lower Elwha Klallam Tribe. A beautiful village full of Native American art and structure, Tillicum Village is surrounding by wilderness and the ocean. Exploration time on the island will have you in awe of its beauty and structure. You may even catch a glimpse of wildlife as well. While walking around the village you will come across workers and guests that can answer any questions you may have and even demonstrate different Native American skills such as cedar weaving. A gift shop is available providing unique and cultural items that range in price. 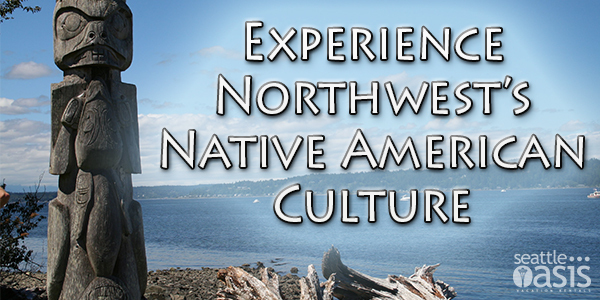 Book your trip today for a fun and knowledgeable experience of Northwest’s Native American culture. This is a wonderful experience for couples or a great way to spend the day learning with your family. All cruises depart from Pier 59, next to the Seattle Aquarium. Book online to save 20% off.